If you've got a MacBook or MacBook Pro, having to juggle all the various dongles required for a flexible workflow is a small nightmare in itself, but that's an issue that can be mitigated by the use of a USB-C hub. Although you might still need a spaghetti-like pile of cables to get your work done, it can be consolidated down to just a couple when it comes time to plug things in. So those of us rationalizing the #donglelife (like me) are constantly on the search for something that might make it a bit more tolerable. 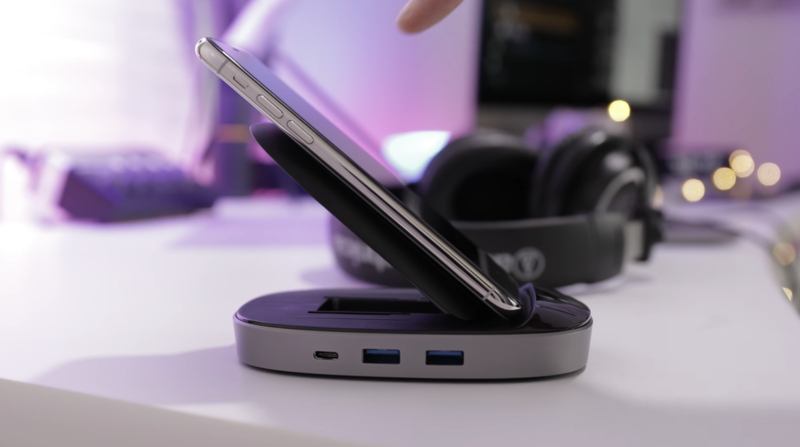 The HyperDrive takes the convenience of a USB-C hub and adds in a three-coil Qi-compatible wireless charger that can spit 5, 7.5, 10, and 15W, making it compatible with most devices at their maximum supported speeds. It's even got a tilting hinge to prop your phone up, along with a plethora of connectivity options (HDMI, gigabit ethernet, microSD, SD, 3xUSB 3.1, and USB-C with 60W Power Delivery passthrough). And, by all appearances, it's not too big, either. At the time of writing, the HyperDrive is 368% funded with 31 days left to go. The only price option left for new backers interested in picking one up is $109—ostensibly $50 off the retail price. It's up to you if a Kickstarter is worth the risk, but either way, it might be worth taking a look at once the HyperDrive lands.